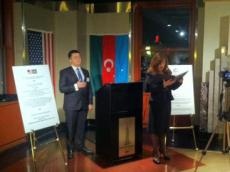 A reception has been organized to mark the 55th and 21st anniversaries of the Azerbaijan Society of America (ASA) and the restoration of Azerbaijan`s independence in New York, US. According to ASA, the event held at the landmark Empire State Building brought together more than 100 guests, including diplomats of Azerbaijan, Turkey, Albania, Bulgaria, Macedonia, Uzbekistan and Tajikistan in the country, representatives of governmental, non-governmental and business organizations operating in New York, CBS and other media groups, members of Azerbaijani, Turkish and Jewish societies and students of universities of New York and Columbia. Opening the event, ASA External Relations Director Emin Hasanov briefed the event participants on the society`s history and activity. Other speakers at the event included former congressman Michael McMahon, ASA president Tomris Azeri, permanent representative of Azerbaijan to the UN, ambassador Agshin Mehdiyev, Director General of the Azerbaijani-American Council (AAC) Javid Huseynov, famous architect Danny Forster, director of the Turkish Culture Foundation Nurten Ural, Azerbaijan`s Consul General in Istanbul Hasan Zeynalov, Director of the Kavkaz Jewish Youth Center Lyuba Yusubova, President of the Federation of Turkish-American Associations Ali Cinar, Deputy chairman of the State Committee on Work with Diaspora of Azerbaijan Javanshir Valiyev. The speakers spoke of Azerbaijan`s achievements since the restoration of its independence in 1991, praising ASA`s service for the development of cooperation between Azerbaijan and US. Congratulatory letters by New York Governor Andrew Cuomo, Deputy Foreign Minister and Azerbaijan`s first envoy to the US, ambassador Hafiz Pashayev, Consul General of Israel in New York, ambassador Ido Aharoni and community leaders in Israel and Canada were read out. The event also saw performance by Azerbaijani mugham music master Jeffrey Werbock, opera musician Alexandria Sultanzade, and the Central Asia Vatan dance group in New York.